By Keith Cowing on July 30, 2010 6:34 PM. By Keith Cowing on July 30, 2010 5:31 PM. "With little time remaining in the fiscal year that ends Sept. 30, House Science and Technology Committee Chairman Rep. Bart Gordon (D-Tenn.) sought to bring the measure to the House floor under suspension of the rules -- a move that prevents amendments to a bill and requires a two-thirds majority vote to pass. But Gordon encountered resistance from House members hoping to weigh in on the measure during floor debate. Rep. Adam Schiff (D-Calif.) and other House Democrats met with Gordon early July 29 to address concerns with key elements of the legislation." "Concerns quickly prompted the Buckeye State and Golden State lawmakers to approach House Majority Leader Steny Hoyer (D-Md.) on Wednesday to complain. Hoyer directed the members to huddle with Gordon on Thursday morning to resolve political tensions, according to a source close to the process. Some say that lawmakers took from that meeting a guarantee that the chairman would not try to rush the bill under rules that prevent amendments and are generally reserved for non-controversial measures. So many were surprised when Gordon soon resumed pushing to bring up the NASA authorization bill with the help of those suspension rules." By Keith Cowing on July 30, 2010 2:44 PM. "Since leaving her position at NASA, [April Jean] Evans has devoted much of her time to building support for an international treaty that would ban primate experiments for the purpose of space exploration. Already the European Space Agency has adopted such a position, with Director Jean-Jacques Dordain stating in an April 1 letter that ESA's formal position is: "there is absolutely no research interest or planning for experiments with primates." Such is Evans' aspiration that all space agencies would adopt a similar position. But there's also the real-world issue of no longer having a regular income. Since leaving NASA, Evans has moved into her brother's spare room. She's also falling into debt." Keith's note: PeTA tells me that April Jean Evans is supposed to be on CNN Headline News Channel on "Issues With Jane Velez-Mitchell" at 7 pm EDT tonight to talk about this. If you are going to comment on NASAWatch, then stay on topic and don't try and post stupid stuff anonymously - it won't appear online. Showdown Ahead For H.R. 5781? By Keith Cowing on July 29, 2010 7:26 PM. "House sources said July 28 that a floor vote on the NASA authorization could come as early as July 29, but opponents of the bill -- primarily commercial space advocates -- were successful in stalling the measure, which now is unlikely to be considered before July 30, sources said. Gordon is seeking to bring the measure to the House floor under suspension of the rules, a procedural tactic that prevents amendments to a bill during limited floor debate and which requires a two-thirds majority vote to pass." "H.R. 5781, the House's version of the $19 billion NASA authorization bill for fiscal 2011, lops off most of $6 billion being sought by the Obama administration for boosting the development of commercial spaceships capable of bringing astronauts to the International Space Station over the next five years. Instead, it would put more money into the internal NASA rocket development program - although not as much as previously budgeted under a plan that an independent panel said was "not viable." "The House bill only calls for $150 million in direct funding for commercial crew projects through 2013. NASA would provide another $100 million per year under the pending legislation, summing an investment of $450 million spread over three years. Those figures are significantly lower than the budget proposed in the Senate's authorization act and the Senate's spending bill, which offer $1.3 billion in commercial crew funding over the same time period." By Keith Cowing on July 29, 2010 12:35 PM. "If you care about the future of American space exploration, your urgent help is necessary. The only hope for the average citizen to one day travel to space is in danger due to the actions of certain members of Congress. SpaceX does not have the enormous lobbying power of the big government contractors to stop them, however with your help the day can still be saved. NASA's Authorization bill (H.R. 5781) will be debated on the floor of the US House of Representatives tomorrow. Despite the imminent retirement of the Space Shuttle, H.R. 5781 authorizes over five times as many taxpayer dollars to fly NASA astronauts on the Russian Soyuz than it invests in developing an American commercial alternative, moreover at a time when jobs are sorely needed in the United States. Quite simply, this bill represents the sort of senseless pork politics that has driven our national debt to the point where our economy can barely service it. The bill is expected to be brought to the House floor this Friday under a special "suspension of the rules," which is a procedure that limits debate and amendments. Telephone your Congressional representative right away via the House Switchboard at (202) 225-3121 and ask them to vote NO on H.R. 5781, and instead support the bill unanimously agreed to in the Senate last week. Your five minutes will make a critical difference, ensuring an exciting and inspiring future in space travel! SpaceX rarely asks you to take action, so you know it really matters when we do. Look up your representative here." By Keith Cowing on July 28, 2010 3:33 PM. "Should NASA screen everything that the team plans to say in public? Should we, the Kepler team, screen everything our colleagues plan to say in public? I think that the best we can do is ask our colleagues for advice to make sure that we are understood. Perhaps that would have helped Dimitar. There are articles out there that say he shouldn't be allowed to speak in public. Yes, you heard me correctly -- that he shouldn't be allowed to speak. Rubbish. I can only say that I will take this PR blunder any day of the week over a work environment that does not give me academic freedom to speak within the reasonable agreements that I have with my colleagues. Any day." Keith's note: Let me be clear, does Ditimar Sasselov have the right to speak his mind in public about his research? Of course he does. Does Sasselov have a professional responsibility as the Co-Investigator on an enormously expensive, taxpayer-funded NASA mission to get his facts straight before he speaks? Of course he does. Does he (and the rest of his team) need to be internally and externally consistent when it comes to the rationale for what they do or do not want to release, how they release it, and where they release it? Of course they do. Perhaps most importantly, do the people who are chosen to speak publicly (and those who decide to speak publicly on their own) about these enormously important research projects need to understand how to communicate their jargon-filled, complex ideas to the public at large? Of course they do. Bad communication is often worse than no communication at all. Millions of people stopped what they were doing to read these stories about "Earth-like planets" circling other suns. Such words have meaning. 99.999% of humans don't dwell on the nature of planetary cores and the other excuses offered in support of the use of the term "Earth-like" in this lecture. We live on Earth. This guy said there are worlds out there "like Earth". Lots of them. 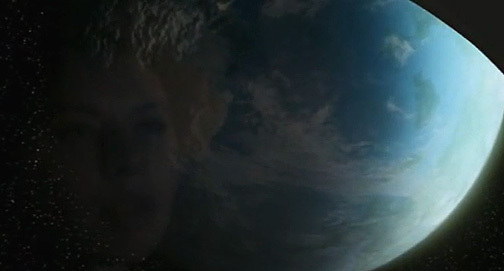 When most people hear the words "Earth-like" they look out the window at Earth. They don't run to grab a textbook or Google some planetary geology website. This is paradigm shifting stuff. Its about confirmation of centuries of speculation and dreaming as to the nature of our world's uniqueness and/or commonness with regard to the universe around us. Now the Kepler team is fumbling its way through clarification of what was said and was not said, implied and miscommunicated. Instead of channeling the eventual (and apparently inevitable if the statistics are to be believed) incredible news in a way that could really show the world what is waiting out there for us, back peddling and PR spinning is now what we hear. We should be cheering in the streets. As far as small little rocky worlds go, we are not alone. How profound is that !? Alas, when the news is eventually released, as everyone seems to think it will be, there will be a caveat tossed in - people will wonder if this is the real thing or yet another false alarm. Leave it to NASA scientists to screw up a good thing like this. If you are going to go out and talk about things with such an epochal potential for all humans to think about, you owe it to everyone involved (in other words everyone, everywhere) to make damn sure you know how to convey this information. If not, then find someone who can do it. We could certainly use Carl Sagan right now. By Keith Cowing on July 28, 2010 12:06 PM. "In 2009, Challenger Center, in partnership with Green Trail Energy, Inc., brought a large solar and wind power system to Desert RATS. Formally known as the GSW-7000, this device is a self-contained portable trailer that is capable of generating up to 4.4 kilowatts of power from the sun and 2.4 kilowatts of power from wind energy. As was the case last year, the GSW-7000 will be used to power education and public outreach activities that the Challenger Center will conduct at Desert RATS under its educational Space Act Agreement with NASA. Last year, the GSW-7000 was used on a trial basis to recharge batteries on several of NASA's robotic vehicles. That activity will continue this year as well." By Keith Cowing on July 28, 2010 7:22 AM. By Keith Cowing on July 27, 2010 10:15 PM. "The Commercial Spaceflight Federation is pleased to announce that Andrews Space, Inc., DCI Services and Consulting, MEI Technologies, Special Aerospace Services, and SRA International have joined the Federation as Associate Members. The Commercial Spaceflight Federation now includes over 30 leading aerospace companies." By Keith Cowing on July 27, 2010 4:52 PM. "Since the time of Nicolaus Copernicus five centuries ago, people have wondered whether there are other planets like Earth in the universe. Today scientists are closer than ever to an answer -- and it appears to be that the Milky Way galaxy is rich in Earth-sized planets, according to astronomer Dimitar Sasselov. Drawing on new findings from a NASA telescope, he told the TED Global conference in Oxford, England earlier this month that nearly 150 Earth-sized planets have been detected so far. He estimated that the overall number of planets in the galaxy with "similar conditions to the conditions that we experience here on Earth is pretty staggering. It's about 100 million such planets." "[Sasselov] says his chart uses the same data that was presented in Kepler's previous announcement, only it has been "rebinned" to include candidates with larger radii, up to 2.9 times the radius of the Earth. The chart label fell victim to TED font size requirements, and the "9" was lopped off instead of being rounded up. "The chart definitely has a mistake," Sasselov told New Scientist." "One of the scientists who works on the Kepler planet-hunting mission, Dimitar Sasselov, inadvertently set off a bit of a controversy when he appeared to announce that its first big data release implied that our galaxy is rich in Earth-like planets, with approximately 100 million habitable ones. That might be great news, except for some awkward facts: he dropped the news during an informal TED talk, and nobody at NASA or elsewhere was prepared to back up his assertions. In fact, the Kepler team has faced a bit of a backlash for its decision to limit the release of data on Earth-like candidates. Had Sasselov spilled the beans?" "NASA Watch's Keith Cowing said he was confused by Sasselov's seemingly significant non-news: "The Kepler folks seem to want to have things both ways," he wrote. "On one hand they want to tantalize us (and select audiences) with what they have found but yet at the same time they do not want to put their reputations on the line when people start taking their comments as fact. This project clearly needs to put some PR strategy in place." My efforts to get comments from Sasselov or other members of the Kepler team today were unsuccessful, but NASA spokesman Michael Mewhinney did tell me that the scientists are preparing a fresh response and would provide further clarification on Tuesday. So check back here for updates as they become available." Keith's 2:28 pm EDT note: My reaction to this news is not unlike my reaction to the opening scene of the early Star Trek Enterprise episode "Strange New World" - and the crew's reaction to seeing an M-Class planet unexpectedly fill the view out a window. As Crewman Novakovich comments to Crewman Cutler, "You'd think that the Captain would make an announcement or something". The discussion between Captain Archer and T'Pol about Archer's impatience to see and explore the new world is equally appropriate to the current Kepler story. ARC PAO's Michael Mewhinney and his cohorts have had several days to come up with a response. While the world is buzzing about this astonishing news we've heard nothing from the Kepler team. Someone needs to light a fire under Mewhinney et al The fact that NASA can't get its act together to address this news is baffling. Trully baffling. I can understand dragging their feet when there is bad news, but when paradigm-shifting, awe-inspiring news like this starts to circulate around our planet, the agency's inability to address it makes me wonder if the agency trully understands what it is doing - and the impact it can have on they way we view the universe. Keith's 4:52 pm EDT update: Finally - a response from the Kepler folks - via Twitter here: "@KeithCowing We're working on it! New Kepler blog contribution from Dimitar is on its way. Will tweet the moment it's ready." and here: "@NASAWatch Kepler blog contribution from Dimitar Sasselov is expected to be out today." By Keith Cowing on July 26, 2010 11:53 PM. Frank Sietzen, Jr.: Seemingly lost among the noise following last week's actions of the House Commerce and Science Committee and the Senate Appropriations Committee on marking up a NASA budget is the issue of the agency's proposed new technology programs. Both the House and Senate sharply cut the Obama Administration's original request. As of this writing no dissent has been heard from the other end of Pennsylvania Avenue, so the cuts might stick. It might be useful to review what the Obama Administration originally asked for - and why. Continue reading Getting Out of the Gravity Well on One Thin Dime. By Keith Cowing on July 26, 2010 8:32 AM. "The out-of-control Galaxy 15 spacecraft will pass near three more orbiting broadcast platforms before it loses power in late August or early September, putting an end to the zombie satellite's menacing tour of the geostationary arc. Galaxy 15 stopped responding to commands from ground controllers in April, most likely due to a solar flare that zapped the satellite's electronics. But engineers are still analyzing the cause, according to David Thompson, chairman and CEO of Orbital Sciences Corp. Orbital manufactured Galaxy 15 for Intelsat." Continue reading Kepler Co-Investigator Spills The Beans: Lots of Earth-like Planets. By Keith Cowing on July 24, 2010 1:42 PM. Keith's note: You can watch Newspace 2010 live at Spacevidcast. You can follow it on here on Twitter as well. One interesting comment this morning from NASA HQ's Charles Miller: "NASA admits that it is not a reliable customer". Alas, these panels are almost exclusively composed of white males in their late 40's/early 50's. No females and rarely a darker shade of skin are to be found. I know these folks, so this is most certainly not a matter of discrimination by any means. Rather, it is evidence of a total lack of imagination in terms of outreach, mentoring, and trying to embrace the real world within which space commerce is but a miniscule part. I have watched/attended these Space Frontier Foundation things year after year. Without fail, its always the same people talking about the same stuff. Lots of arm waving - but rarely any concrete solutions. NASA is always cast as simultaneously being the enemy and the source of funds for everyone's pet project. Same thing goes for Congress. No attempt is made to get outside the box and try and be relevant to the real world and the economic, societal, and political forces that make things work. The Space Frontier Foundation used to have some radical thinking. Now it has all evaporated away. All that's left is what you see on these panels - old thinking. If your new business idea depends on government handouts and/or favoritism then you don't have the right product or the right business plan. You are just chasing after a new flavor of pork. By Keith Cowing on July 23, 2010 10:37 PM. "It was like a discount electronics attack from outer space. Earlier today, NASA's Twitter feed for astronauts currently in space (@NASA_Astronauts) briefly broke with the standard space jibber jabber, jammed on the cap locks, and subjected followers to an onslaught of messages about "BRAND NEW PLASMA FLAT SCREEN TV!!! WHOLESALE LIST!" By Keith Cowing on July 23, 2010 12:26 PM. "President Barack Obama's NASA proposal currently being scrutinized by Congress focuses on researching propulsion for deep space and asteroid landings. It scraps the Constellation Project, which was launched six years ago with the aim of sending humans to Mars and back to the moon. The proposal would also halt NASA shuttle launches to the International Space Station. Instead, federal funds would be used to help send U.S. commercial shuttles to the station. Clark Moody, who remembers watching NASA videos with his dad in the 1980s, is a graduate student in aerospace engineering at Texas A&M University. He worries that NASA's other feats could be lost on the general public without the highly visible human spaceflight endeavors." By Keith Cowing on July 23, 2010 7:03 AM. "Around 2005, space entrepreneur Dennis Wingo and Keith Cowing of NASA Watch learned of prior attempts at restoring the images. With a renewed interest from NASA in moon exploration and the Lunar Reconnaissance Orbiter set to go to the moon in 2009. Wingo and Cowing became more and more motivated to work towards restoring the tapes." By Keith Cowing on July 22, 2010 7:23 PM. "The plan orders NASA to build a heavy-lift rocket and capsule capable of reaching the International Space Station by 2016. But it budgets less money for the new spacecraft - roughly $11 billion over three years, with $3 billion next year -- than what the troubled Constellation program would have received. That - plus the short deadline -- has set off alarms. Days before the compromise was announced, NASA chief Charlie Bolden and Deputy Lori Garver told its two champions -- U.S. Sens. Bill Nelson, D-Florida and Kay Bailey Hutchison, R-Texas -- that NASA could not finish the proposed new rocket before 2020, according to three sources present at the meetings. When asked about the conversation, Nelson spokesman Dan McLaughlin said the NASA officials were responding to lower dollar figures than what Congress ultimately approved. NASA spokesman Michael Cabbage said it "would not be appropriate to discuss private conversations between NASA and members of Congress." By Keith Cowing on July 22, 2010 4:36 PM. Keith's note: Word has it that there are big worries at NASA and Northrop Grumman with regard to Webb Space Telescope. If NASA ends up operating under a Continuing Resolution - one that does not provide the increased funds that Webb requires - there is a fear that large layoffs may be in the near-term forecast. Stay tuned. By Keith Cowing on July 22, 2010 2:13 PM. "The President's NASA budget replaces an over-budget and behind-schedule Constellation Program with a sustainable architecture that will take the Agency in a new direction enabling NASA to explore more of our universe. It offers a serious plan to reduce the cost of access to the International Space Station, without exporting that responsibility to other nations. We believe this new direction is good for the country and that California's NASA centers and those across the country can help take NASA to new and exciting destinations. We hope to work with you as you move this important legislation forward." By Keith Cowing on July 22, 2010 2:03 PM. "According to the bill text, commercial crew programs would get just $50 million annually through 2015 and another $500 million over that same time period via direct government loans or loan guarantees. Although the bill fully funds the $4.2 billion sought for routine commercial cargo resupply runs to the space station starting in 2011, it reduces the president's $312 million request for NASA's Commercial Orbital Transportation Service (COTS) program next year to just $14 million. The Senate version provided $300 million for the agency's COTS providers in 2011." "There is no additional shuttle flight, funding would be slashed for commercial rockets and NASA would be told to "restructure" the Constellation program that Obama wanted to kill. The bill diverges significantly from a measure approved by a Senate panel last week, which the White House supports. The differences threaten to delay consensus on the space agency's policy. "We are facing tough economic times that demand tough choices," said Rep. Bart Gordon, D-Tenn., chairman of the House Science and Technology Committee." "Senator Kay Bailey Hutchison (R-Texas), Ranking Member on the Senate Commerce, Science, and Transportation Committee, said the approval of the Commerce, Science, Justice Appropriations legislation by the Senate Appropriations Committee today presents a unified Senate position on NASA and the future of America's human spaceflight programs." Keith's note: There may come a point where the White House says that they cannot support this "compromise". It all seems to hinge on whether the "compromise" that the White House got with the Senate prevails over the "compromise" that the House wants - one that the White House has been silent about thus far. Either way, Congress has thrown the original White House proposal back in OMB/OSTP's face in a form that more or less brings Constellation back to life (minus the name) albeit without Ares 1 or Altair. Ares V simply has a new name. And the commerical aspirations inherent in the White House plans? They are reduced (depending on which "compromise" you look at) to the point of being window dressing - if not outright irrelevant. The fact that the White House has yielded to Congressional pressure can be seen a number of ways. You could just say that they are being pragmatic and realistic with regard to what can be realistically accomplished. But given the way in which they initially hurled the policy out with near zero pre-coordination, and then brought the President in for a quick fix when it flopped, you have to wonder if they even planned things in advance or considered the long term strategic issues that they'd need to address. And now they show little if any spine when Congress repudiates the entire package. This makes you wonder if the White House ever actually had serious interest in this policy in the first place. Indeed, this entire process has been composed of several sudden spikes of activity by the White House followed by long periods of disinterest and/or silence. The fix is in for the time being, it would seem. But you all know that we'll all be revisiting this situation in 18-24 months when costs start to rise and an election amplifies the political rhetoric once again. Is this any way to explore the solar system? By Keith Cowing on July 22, 2010 1:26 PM. "And what's the message for Johnson Space Center? "The first message is we love you," [Rep.] Olson said. "We think about what these men and women are doing right now with all this uncertainty about their future. They're remaining focused on their mission. And my message to them is that help is on the way. The House and Senate are hard at work to ensure that we have a viable space program." "It is extremely encouraging that both the House and Senate, in a bipartisan manner, have recognized the importance of maintaining solid rocket motor technologies, such as the Ares 1 rocket. The draft House version of this bill is a strong repudiation of the President's flawed proposal - stronger even than the good developments we saw last week out of the Senate Committee on Commerce, Science and Transportation." By Keith Cowing on July 22, 2010 12:05 PM. "Even some in Mr. Nelson's home state of Florida begin to doubt the senator's priorities, suspecting they have more to gain from a thriving private market in affordable space travel than from another NASA budgetary blowout that leaves nothing sustainable in its wake. NASA's tragedy is that it never recovered from the success of Apollo. But unless these dissenting voices start to be heard, two things are certain: Taxpayers will shell out a lot of money that will end up wasted when the next NASA funding crisis calls forth the next Augustine Commission. The other certainty is that the space entrepreneurs had better start scrambling for fresh capital and private customers if they want to keep their dreams alive." Keith's note: I am sorry for linking to this article. When I orignally linked to it the entire text was available for free access. Alas, in keeping with an annoying habit, wherein the Wall Street Journal takes popular articles and denies full access after they have become popular, you can't read the whole thing at the original link. The portion that I quoted is from the part of the article that you (or I) can no longer read - unless we give them money. This is why I have stopped linking to WS Journal articles. It just annoys people when they do this. The only way to circumvent this is to use this Google search for the article by title and then click on the link that shows up - but that link only works once. By Keith Cowing on July 22, 2010 10:29 AM. Keith's note: Markup of H.R.5781- the National Aeronautics and Space Administration Authorization Act of 2010 - by the House Science and technology Committee is underway. Watch the webcast here. Earlier Twitter updates by Marcia Smith can be read here. According to Marcia the Senate Appropriations Committee Markup of CJS Bill is at 2:30 pm today. The CJS bill includes NASA and NOAA. By Keith Cowing on July 21, 2010 5:19 PM. "Florida and Texas are trying to make an end run around NASA's competitive process to decide where to give the retired space shuttles by getting Congress to weigh the decision in their favor. ... Tucked into the NASA reauthorization bill that Congress is now taking up is a provision which directs NASA to give "priority consideration" to a site with a historical relationship with "either the launch, flight operations, or processing of the Space Shuttle orbiters." By Keith Cowing on July 21, 2010 1:22 PM. "U.S. Senator Richard Shelby (R-Ala.), ranking member of the Commerce, Justice, Science, and Related Agencies Appropriations Subcommittee (CJS), today announced subcommittee approval of the fiscal year 2011 CJS Appropriations bill, which restores significant funding for NASA's human space flight program. Following today's action by the subcommittee, the bill will now go to the full Appropriations Committee for consideration." By Keith Cowing on July 21, 2010 9:52 AM. Subcommittee Markup of the Fiscal Year 2011 Commerce, Justice, Science and Related Agencies Appropriations Bill. 10:00 AM, Location: Dirksen 192. "The U.S. must act to ensure global leadership, competitiveness and innovation in space." By Keith Cowing on July 20, 2010 5:51 PM. "This week, Chairman Gordon of the House Committee on Science and Technology released his Committee's version of the NASA Reauthorization Bill. Cosponsored by Committee Ranking Member Hall, Space and Aeronautics Subcommittee Chairwoman Giffords and Space and Aeronautics Ranking Member Olson, the bill reflects the Committee's belief of those plan components necessary to assure a worthy national space and aeronautics program." By Keith Cowing on July 20, 2010 10:29 AM. Keith's note: One thing that the House version of the NASA Authorization Act does is to cut further into proposed commercial activity - specifically, CRuSR (Commercial Reusable Suborbital Research). In this draft House Legislation, funding for CRuSR is cut in FY 2011 and FY 2012 from the President's and Senate's mark at $15M per year year down to just $1M per year, with funding unspecified in later years. In addition, according to the draft language, CRuSR's funding in FY 2011 may not be used to buy flights or build payloads. Instead it can be used only to fund studies. If you look at Sec. 906 (page 94) you will see that this proposed draft adds onerous restrictions before NASA can spend money on CRuSR, using identical language to restrictions placed on Commercial Crew in the same legislation, e.g., NASA may not proceed with a CRuSR RFP until all indemnification and liability issues are settled and a report has been sent to Congress. More than 300 researchers and educators, specializing in fields ranging from microgravity and life sciences to astronomy and atmospheric sciences, from all over the U.S. showed up at a conference in February wanting to use this program. It would seem that anti-suborbital research and anti-commercial forces from within and outside of the agency are at work once again. SMD AA Ed Weiler has long been opposed to suborbital research and has clearly been working behind the scenes to take yet another run at killing this sort of activity. Just look where the CRuSR money is going (if the House gets its way): sounding rockets launched out of Wallops. By Keith Cowing on July 20, 2010 7:49 AM. "The U.S. solid rocket motor industry is "over capacity" and needs consolidation, the Pentagon's top official for industrial policy said. "It is over capacity right now," Brett Lambert said at the Farnborough Airshow on Monday, adding a consolidation was long overdue." Keith's note: I'm confused. First DoD complains that cuts to solid rocket motor production capacity and procurement options resulting from Constellation cancellation would be a big problem. Now they say that the U.S. has to much solid rocket capacity. Well, which is it? By Keith Cowing on July 20, 2010 2:11 AM. "(10) In an environment of constrained budgets, responsible stewardship of taxpayer-provided resources makes it imperative that NASA's exploration program be carried out in a manner that builds on the investments made to date in the Orion, Ares I, and heavy lift projects and other activities of the exploration program in existence prior to fiscal year 2011 rather than discarding them. A restructured exploration program should pursue the incremental development and demonstration of crewed and heavy-lift transportation systems in a manner that ensures that investments to provide assured access to low-Earth orbit also directly support the expeditious development of the heavy lift launch vehicle system, minimize the looming human space flight ''gap'', provide a very high level of crew safety, and enable challenging missions beyond low-Earth orbit in a timely manner." By Keith Cowing on July 19, 2010 3:19 PM. "The Commercial Spaceflight Federation is pleased to announce that Pratt & Whitney Rocketdyne has joined the Federation as an Associate Member. With 3,100 employees across Florida, California, Alabama, and Mississippi, including more than 1,800 employees in Southern California, the company is a leading provider of propulsion and power systems for space flight." By Keith Cowing on July 19, 2010 2:54 PM. "Yvonne Pendleton has been named director of the NASA Lunar Science Institute (NLSI) headquartered at NASA's Ames Research Center, Moffett Field, Calif. Pendleton has served as the NASA Ames deputy associate center director, chief of the Space Science and Astrobiology Division and as a research astrophysicist for 31 years, including nearly two years at NASA headquarters." The Senate NASA Compromise: A Hinge of History? By Keith Cowing on July 18, 2010 11:01 PM. Frank Sietzen Jr.: Last week, the Senate Commerce, Science and Space Committee marked up a draft of a proposed FY2011 Authorization bill for NASA. That bill maintains the Obama administration's top line budget for the civil space agency, but otherwise it contains virtually none of the individual funding areas for human spaceflight that the administration had sought. But it's my contention that the bill, whether or not it ever gets passed into law, is an historic development in legislative space affairs. Back in 2004, in our book "New Moon Rising", Keith Cowing and I used the phrase "opening a hinge of history" to describe how the Columbia Space Shuttle disaster provided an opening for an historic new direction in space policy. We initially perceived that direction as being the first era of human spaceflight since 1972 that was not to be dominated by the Shuttle program. But what really emerged would eventually become the so-called "Vision for Space Exploration". Continue reading The Senate NASA Compromise: A Hinge of History?. By Keith Cowing on July 18, 2010 9:32 PM. "Bolden's comments are a reminder of what we could do, what we could be and how we could continue to help create a better world. He could make it happen if he had the political backing of national will. That his comments ring hollow and make him appear nearly foolish to many shows the tragedy of having an American president who thinks we are unexceptional, arrogant to assume we can lead and too poor to tell our children there is more to see, to do and to learn. What he said was, "Yes, we can!" What he did was, no, we can't. So, it makes me sad for my friend Charlie. And, it makes me sad for my country." By Keith Cowing on July 18, 2010 9:30 PM. "The $150-million facility was built to contain the next-generation manned spacecraft for the Constellation program, NASA's project to send humans back to the moon. It is the largest acoustic test chamber in the world, created to buffet the spacecraft with intense sound waves, simulating the stresses of launch. The only problem is that the Constellation program almost certainly will be dead within months. President Obama in January proposed cancelling the troubled moon program, and a key Senate committee voted this week to kill Constellation." "Portions of the Constellation program, including the Orion crew capsule and a heavy-lift rocket designed to travel to Mars, appear likely to survive in some form but details won't be known until the final vote. The $19 billion budget provides for another shuttle flight some time next summer in addition to planned launches in November and February next year." "There's a lot for Houstonians to like in the $19 billion spending plan. While it cancels the Constellation program moon missions, it substitutes Mars and asteroids as long-term destinations. It will extend the life of the International Space Station through 2020, direct NASA to build a new heavy-lift launch rocket to be operational in six years, and continue development of the Orion crew exploration vehicle. At the same time it preserves the thrust of the Obama plan to support development of commercial launch crews to low Earth orbit." Keith's note: The folks at the LA Times should do a little more fact checking. Yes, Constellation is being cancelled, but no Orion is not. So this test stand will still find use. By Jason Rhian on July 16, 2010 4:04 PM. 'Building on the success of their first static-fire, Alliant Techsystems (ATK) and NASA are preparing for the second Ares I first stage five-segment Development Motor (DM-2) test. As engineers and technicians prepare for the test, scheduled for September 2, the question is - will there be a use for it should the just announced NASA reauthorization bill passes? "Every test we do on these SRBs has relevance," said George Torres the Vice President of Alliant Techsystems' Aerospace Systems, "whether it's a new heavy-lift rocket or a crewed vehicle, that information gets utilized in some fashion." By Keith Cowing on July 15, 2010 10:14 PM. "The committee acceded on the cancellation of the Ares I rocket, which is part of the return-to-the-moon program known as Constellation, but called on NASA to start development of a larger heavy-lift rocket in 2011, likely to be based on shuttle components, that could be ready for launching by the end of 2016. The administration had proposed waiting until as late as 2015 to start work on a heavy-lift rocket, which would be needed for human missions to asteroids and Mars." "Although the White House has not formally signaled its approval of the Senate plan, there may be enough carrots in the proposed legislation to win Obama's support. "We think this is a great start," said Lori Garver, NASA's deputy administrator. "It accomplishes the major shifts the president set out to have for the space program." An unnamed White House official not authorized to comment said "the bill appears to contain the critical elements necessary for achieving the president's mission for NASA." "The NASA plan approved by the Senate Commerce, Science and Transportation Committee supports President Obama's call to end the moon-bound Constellation program, the human space flight successor to the shuttle program. But the three-year NASA spending plan passed by the committee adds a $1 billion shuttle mission to the International Space Station for next summer or fall and leaves contracts, equipment and personnel in place in case other flights are needed." "In a rare victory for bipartisanship and the legislative branch, Congress has rallied behind an important compromise plan to ensure continued American leadership in space. Six months after the release of the president's budget -- which effectively mothballed NASA's exploration program -- the Senate and House have sent a clear signal to the White House that such cuts are unacceptable." "I am very pleased with many provisions of this bill as it returns us to a balanced mix of commercial and government funded space travel and research and development for future systems. This bill is a breakthrough in moving us much closer to the positions established by Senator Shelby. This bill is good for the Nation, good for Alabama and good for Huntsville." "However, Space Coast officials had bought into Obama's plan to spend $10.1 billion to develop capacity for commercial rockets to fly astronauts to the International Space Station, more robotic missions and technology research that the administration had said would produce a new rocket capable of flying humans to an asteroid by 2025. Brevard officials had hoped that Kennedy Space Center and surrounding businesses could compete for more commercial launches and robotic missions as well as chunks of the research money." "In exchange for slowing work on commercial space taxis and gutting the Obama administration's proposed five-year, $7.8-billion new-technologies initiative, the Senate authorization would add at least one more shuttle mission to the two remaining flights on the manifest, and maintain the capability to fly a contingency mission to the space station through at least Sept. 30, 2011." Is NASA Advertising Allowed or Prohibited? By Keith Cowing on July 15, 2010 10:02 PM. "NASA/GRC has a requirement for the purchase of display units located at the "Arrival" and "Exit" walls at Cleveland Hopkins Airport, Cleveland, OH. These displays will be used for education and information purposes and will be available to us for a period of eight (8) weeks." Keith's note: It is not that I don't think NASA should do more to present its value to the taxpayers (they should), but I find it rather curious that Congress is directing NASA to market itself to the American public - and that Congress is doing so after years of chastising NASA for trying to market itself to Congress - directly or indirectly - and even putting prohibitions on advertising, marketing, etc. into law. This is really confusing given that Congress is supposed to serve the the public in the first place. How better to do that than to say "hey, come over here and look at this". If GRC can get away with overt advertising (billboards are rather large after all) then why can't other NASA centers do this? By Keith Cowing on July 15, 2010 1:37 PM. "The Senate Commerce, Science, and Transportation Committee today unanimously approved legislation cosponsored by Senator Kay Bailey Hutchison (R-Texas), Ranking Member on the Committee, to safeguard America's human spaceflight capabilities while balancing commercial space investment with a robust mission for NASA. The bill was sponsored by Committee Chairman John D. Rockefeller (D-W.Va.) and cosponsored by Senators Bill Nelson (D-Fla.), David Vitter (R-La.) and George LeMieux (R-Fla.)." "The bill would authorize NASA appropriations for FY 2011-2013 with the same top-line budget values as the President's request to Congress. The bill would support an overall growth in science, aeronautics, and space technology and define a long-term goal for human space flight to expand a permanent human presence beyond low-Earth orbit. Key objectives of this goal would include full utilization of the International Space Station (ISS), determining the ability of humans to live in space for extended periods of time, maximizing the role of space exploration and technology in current and future missions, advancing knowledge and inspiring young people into higher education, and building upon international partnerships." Sec. 204 - Independent Study on Human Exploration of Space - Provides for an assessment by the National Academies of the President's plan for HSF and exploration." "Following today's executive session of the Senate Commerce Committee, the President of the Commercial Spaceflight Federation, Bretton Alexander, stated, "Thanks to Senators Warner, Boxer, Udall, and Brownback, American industry won a victory today. But this legislation must be improved so that we create more sustainable American jobs, instead of exporting jobs to Russia. This compromise committee bill represents progress from the original draft, but there is still a long way to go to get to where the Augustine Committee said NASA needs to be." "The Greater Houston Partnership today praised the bipartisan Senate authorization bill, a compromise effort marshaled by Sen. Kay Bailey Hutchison that would extend the life of the space shuttle program by a year; accelerate development of a heavy-lift launch vehicle; and preserve elements of the Constellation program." By Keith Cowing on July 15, 2010 7:41 AM. "[Thursday], U.S. Senator Kay Bailey Hutchison (R-Texas), Ranking Member of the Senate Committee on Commerce, Science and Transportation, and U.S. Senator Bill Nelson (D-Florida), Chairman of the Commerce Subcommittee on Science and Space, will be joined by a number of their colleagues at a press conference on Thursday, July 15 at 11:45 a.m. EST in the Senate Radio and TV Gallery to discuss a major breakthrough on the NASA reauthorization bill. Tomorrow morning before the press conference, the U.S. Senate Committee on Commerce, Science, and Transportation will meet in an executive session to mark up the NASA reauthorization bill." "And indeed, a senior administration official said the White House likely would not oppose the measure because it gives commercial rocket companies funding -- though less than what Obama had sought -- even as it speeds up design of a heavy-lift rocket that under Obama's timetable would not have flown until 2025. "While we are still in the process of reviewing the details of the draft, the bill appears to contain the critical elements necessary for achieving the president's vision for NASA and represents an important first step towards helping us achieve the key goals the president has laid out," said the aide, who was not authorized to speak on the record." "A NASA Authorization Act that is likely to clear a U.S. Senate committee today could squander a rare opportunity for the Space Coast to transform its economy, local economic development officials said Wednesday. "The risk that this future may be bargained away for one more attuned to the needs of Alabama, Texas and Utah, in the name of political expediency, demands a response," leaders of the Economic Development Commission of Florida's Space Coast wrote in a letter to Sen. Bill Nelson." "By most accounts, Mr. Obama's proposal has failed to take off in Congress. Advocates of prolonging the shuttle program don't like it. Neither do lawmakers who represent districts counting on money and jobs from Constellation. Its prospects for passage are dim. But if Congress doesn't agree on an alternative, current space policy would survive by default. That would mean another year of work on Constellation -- billions over budget and years behind schedule -- and no real effort to reorient NASA's course." "Very good question...take a look at them side-by-side with respect to the human spaceflight portions...remember, the Hutchison bill (S. 3068) was focused on just the Human Spaceflight portions of NASA Authorization; this is a full authorization bill, so includes all of NASA, from a policy perspective. At the time she introduced her bill, it was noted that it could reflect a potential consensus direction that could form the core of a full NASA authorization bill." The markup happens today at 10:00 am EDT in room 253, Russell Senate Office Building. Nelson and Hutchison will be announcing their "major breakthrough" after that mark up. By Keith Cowing on July 14, 2010 4:35 PM. "I do not believe anyone in Brevard doubts your passion and commitment to NASA and its mission. However, the risk that this future for Florida might be bargained away for one more attuned to the needs of Alabama, Texas and Utah, in the name of political expediency, demands a response. There is no one on the Space Coast, least of all this EDC, that doesn't understand the need for a Heavy Lift Vehicle to enable NASA to go beyond LEO. And we zealously will seek to assure KSC participates fully in that endeavor. However, to sacrifice the workforce that so enriches our future is not something to which we can acquiesce quietly." "We are building consensus in what has otherwise been a consensus-less position of the future of the manned space program. The President had proposed one thing. He altered that. Different people have different ideas. Different aerospace companies all looking to have a certain part of the manned space program also have their different ideas. "Out of this mix, we are trying to bring together Senators to build a consensus in a bipartisan way; the space program is not only not partisan, it is not even bipartisan. It is nonpartisan - to be able to do this in a fairly unanimous way." By Keith Cowing on July 14, 2010 4:02 PM. "Dear Senator Mikulski: The 2011 budget request for NASA has generated much debate about the right course for America in space. You have raised the issue of safety as an indispensable component of any new plan for NASA, and we wish to express our appreciation for your leadership in ensuring that safety is at the center of this debate. Both as astronauts and as citizens who care passionately about the future of human spaceflight, we write today to communicate our views on this critical issue. Let us be clear: we believe that that the private sector, working in partnership with NASA, can safely develop and operate crewed space vehicles to low Earth orbit. We have reached this conclusion for a number of reasons:"
By Keith Cowing on July 14, 2010 12:22 PM. "Public Comments: It is the policy of the PCAST to accept written public comments of any length, and to accommodate oral public comments whenever possible. The PCAST expects that public statements presented at its meetings will not be repetitive of previously submitted oral or written statements. The public comment period for this meeting will take place on July 16, 2010 at a time specified in the meeting agenda posted on the PCAST Web site at http://whitehouse.gov/ostp/pcast. This public comment period is designed only for substantive commentary on PCAST's work, not for business marketing purposes. Oral Comments: To be considered for the public speaker list at the July meeting, interested parties should register to speak at http://whitehouse.gov/ostp/pcast, no later than 5 p.m. Eastern Time on Wednesday, July 6, 2010." Keith's 23 June note: Well folks, if you like the President's space policy - or hate it - here is a chance to let his Science and Technology advisors hear your thoughts. If you pass on the opportunity its your fault. OSTP has extended the invitation - don't pass on the opportunity. This event will be webcast. By Keith Cowing on July 14, 2010 11:32 AM. "Sen. John Rockefeller, chairman of the Committee on Commerce, Science, and Transportation, has submitted the Senate version of the NASA budget this morning. It has been endorsed by Sen. Bill Nelson, a former NASA astronaut who many on the Hill look to for guidance on space issues, as well as Texas Sen. Kay Bailey Hutchison." "Obama requested $6 billion over five years for advanced technologies. The Senate bill requests less than $1 billion over three years." "But the bill's catch -- and one that concerns us -- is that it would phase in $6 billion in funding for the commercial rocket program and other research and development projects that could be staged at KSC instead of providing it up front. That has the potential to slow the creation of new jobs and industries -- and diversification of the space industry -- our region needs. For instance, NASA could spend only $456 million on commercial rocket contracts next year with more allocated in later years, providing the companies meet safety and other requirements for flying astronauts." By Keith Cowing on July 14, 2010 11:07 AM. Note circulating in the Suborbital research community: "As you may know, Sen. Nelson's NASA authorization markup kills the CRuSR line item. Yesterday Senator Tom Udall of New Mexico introduced an amendment that would bolster this small but high-profile program, designed to allow students, small companies, and researchers to fly experiments on-board new commercial suborbital space vehicles such as Virgin Galactic or XCOR Aerospace. The amendment would ensure that this program, known as Commercial Reusable Suborbital Research (CRuSR), would be fully funded at $15 million per year and report directly to NASA's Chief Technology Office to give it high-profile status. Please call your Senators to support the Udall Amendment, call Sen. Nelson's office to support it, and ask colleagues to do the same. The Senate NASA authorizing bill full committee vote is tomorrow (Thu 15 Jul)-- please take time today on this important matter!" "I urge American citizens interested in the affordable utilization and eventual settlement of space to open their eyes to the attack on NASA's new Commercial Crew Program by pork-hungry legislators. Contrary to the White House's request, the NASA Authorization Bill proposes cutting commercial space by $2.1 billion (up to 66%). Virginia's Senator Warner is ready to ride to the rescue with an amendment restoring full funding to the program, but he needs YOUR help to gain support from other Senators." Keith's note: Its really somewhat counterproductive for the Space Frontier Foundation to put out a legislative alert and then insult every possible member of Congress that they seek to have people contact to help their cause i.e. calling them "donkeys" and "elephants". Also, Instead of portraying this as a fight against pork (and indicting all of Congress in so doing) perhaps the proponents should be focusing on the virtues of commercialization instead. By Keith Cowing on July 13, 2010 8:38 PM. "NASA should develop a broad, integrated strategy to contain costs and maintain schedules as earth and space science missions are planned and designed, says a new report by the National Research Council. The report also calls on NASA, Congress, and the Office of Management and Budget (OMB) to consistently use the same method to quantify and track costs." By Keith Cowing on July 13, 2010 5:44 PM. "NASA/DFRC has a requirement for (quantity 2) Interactive Robot Characters with accessories. The specifications are: Two different interactive robot characters will be required for usage with the varied targeted audiences. One male "wise-looking" robot such will be suitable for all audiences whereby a female of somewhat ethnic background may add additional comfort to a more diverse audience or when wanting a female to speak at an all female event. Both robots will offer voice modifiers to raise or lower their pitch, remote controls, batteries, chargers, voice hearing transceivers, MP3 player, instruction booklet, and warranty. Since the male robot will be used more often, he will have moving arms. Additional clothing is needed that can be worn by either robot includes a flight suit, lab coat, and astronaut suit and also where robots can be suited in any children's clothing to adapt to seasonal changes or target audiences." Keith's note: Yesterday we learned about KSC's interest in buying a Welsh robot (complete with accent) to greet visitors. Today we learn that DFRC wants to procure a more ethnically diverse collection of droids, cylons, bots, etc. to interact with the public - one model that is "wise" and another model that is "ethnic" and "female" - and both can also act like "children". Alas, despite the focus on diversity, the male robot still gets to do more work than the female robot. By Keith Cowing on July 13, 2010 1:28 PM. "I assure you, the FY 2011 numbers will appear to be "underfunded" for Commercial crew, because activities in that year wiill be focused heavily on concept development, common technology development, human-rating requirements, review of procurement approaches and performance milestones and funding "gates' that must be accomplished with assurance before any authority to proceed o a procurement effort is initiated, and not before the end of FY 2011. But there will still be a stated commitment to the support and development of such capabilities--including requirements for a crew-rescue capability, meaning six-month on-orbital lifetime certification, etc. Those are the kinds of things that you might expect would constitute the closet thing to articulating the "walk before you run" approach for which there is large consensus in the Congress vis-a-vis commercial crew." By Keith Cowing on July 13, 2010 11:11 AM. "The OIG found that Hanley's reassignment was a management decision made by Douglas Cooke, Associate Administrator for Exploration Systems, with the concurrence of NASA Administrator Charles Bolden, and was taken in response to actions by Hanley that led senior NASA leadership to believe he could no longer effectively lead Constellation during a period when the President was seeking to cancel the Program in the face of significant congressional opposition. ... The OIG review found that Hanley does not claim he was retaliated against through this reassignment and we uncovered no evidence of unlawful reprisal. The OIG also found no evidence to suggest that Hanley was reassigned in order to delay or thwart execution of the Constellation Program or to foreclose Congress's ability to consider alternatives to the Administration's plan for NASA." "After attending the speech. Hanley sent Bolden an e-mail later that day with the subject line "Respectfully submitted." In the e-mail, Hanley thanked Bolden for his words of support, but requested that Bolden "hear us out'" regarding Constellation. He told Bolden that "Walking away so lightly from a focused concerted effort to explore in our lifetimes should be reconsidered," and questioned Bolden for "decisions being made without yourself ever receiving a briefing from anyone in the program as to what we are all about."' He continued that "to not hear our story, directly, and to hear NASA leadership and administration officials further spread the spin and accusations of others without giving us a chance to rebutt [sic] or respond does not align with the core values you recited to us today." By Keith Cowing on July 13, 2010 10:22 AM. "NASA announced three new Centennial Challenges Tuesday, with an overall prize purse of $5 million. NASA's Centennial Challenges are prize competitions for technological achievements by independent teams who work without government funding. NASA sponsors prize competitions because the agency believes student teams, private companies of all sizes and citizen-inventors can provide creative solutions to problems of interest to NASA and the nation," said Bobby Braun, the agency's chief technologist." By Keith Cowing on July 13, 2010 9:05 AM. "NASA's Office of the Chief Technologist will host a Space Technology Industry Forum at the University of Maryland on July 13-14 to discuss the agency's proposed new space technology investments. The event will focus on the President's fiscal year 2011 budget for NASA's new Space Technology Programs. Representatives from industry, academia, and the federal government are invited to learn the latest plans for these programs and discuss strategy, development, and implementation of these broadly applicable technology development activities." By Keith Cowing on July 12, 2010 9:39 PM. "So far data have been available from the first 7 month of the mission containing a total of 2937 targets observed at a 1-min. cadence for periods between 10 days and 7 months. The goals of the asteroseismic part of the Kepler project is to perform detailed studies of stellar interiors. The first results of the asteroseismic analysis are orders of magnitude better than seen before, and this bodes well for how the future analysis of Kepler data for many types of stars will impact our general understanding of stellar structure and evolution." By Keith Cowing on July 12, 2010 3:20 PM. "The White House is contradicting the NASA administrator's claim that President Barack Obama assigned him to reach out to Muslims on science matters. 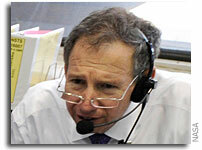 ... White House press secretary Robert Gibbs said Monday that such activities are not among Bolden's assigned tasks. He said administration officials have spoken with NASA about the matter." "Despite his sterling credentials as a former astronaut and military man, Bolden has been a bit of a headache for the White House: Some say he was nominated reluctantly for the post only after Sen. Bill Nelson (D-Fla.) (Bolden's former space shuttle crewmate) insisted that Obama appoint him. Since then, he cried at his first meeting with agency workers and has upset lawmakers and NASA veterans with the administration's new plans for space exploration." "But [White House Press Secretaty] Gibbs on Monday appeared to deny that Bolden was asked to focus on Muslim outreach at all. Asked whether Bolden misspoke, Gibbs said: "I think so." He said he wasn't aware of Obama speaking to Bolden about his comments." "Q I wanted to ask you, there are some comments that the NASA Administrator, Charles Bolden, made a couple weeks back that drew some interest, specifically from conservatives who are wondering why we he said that one of the charges that the President gave him when he got the job was that he had to focus on outreach to the Muslim world. Why is the NASA Administrator doing that? MR. GIBBS: That's an excellent question, and I don't think -- that was not his task, and that's not the task of NASA." Keith's update: It looks like Charlie Bolden did NOT get the direction to do outreach to Muslim countries from President Obama after all. Continue reading UDPATE: Obama DID NOT "Charge" Bolden To Do Muslim Country Outreach. By Keith Cowing on July 12, 2010 2:50 PM. "As former board members of the Columbia Accident Investigation Board (CAIB), we agree with your view that assuring crew safety is an essential element in the discussion of future U.S. crew transportation systems. As members of the CAIB, we have also noted with interest recent space policy discussions where our report has been cited. In particular, we have been somewhat surprised to learn that some people, both within and outside of the Congress, have interpreted the new White House strategy for space which gives a greater role to the commercial sector in providing crew transportation services to the International Space Station, as being not in line with the findings and recommendations of the CAIB report. Our view is that NASA's new direction can be a) just as safe, if not more safe, than government-controlled alternatives b) will achieve higher safety than that of the Space Shuttle, and c) is directly in line with the recommendations of the CAIB." By Keith Cowing on July 12, 2010 1:09 PM. "Frank DiBello, the president of Space Florida, the state's aerospace development body, is not pleased. "We don't want to sacrifice Florida seed corn for an increased R&D role to be politically expedient and save jobs for Utah and other states," DiBello told a Brevard County jobs-development meeting Saturday. "The Senate bill kills outright the promise of a real R&D opportunity for KSC. It's not good for Florida. I don't know who Bill Nelson is listening to, but it's not his constituents," DiBello said." By Keith Cowing on July 12, 2010 10:22 AM. 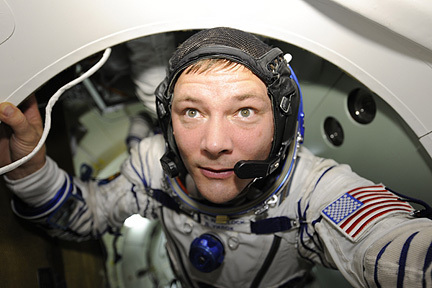 "As a strong supporter of a robust NASA human spaceflight program, the Commercial Spaceflight Federation is releasing the following statement to address topics related to human spaceflight, including commercial human spaceflight. Please see items below on the topics of capability, safety, and cost savings." By Keith Cowing on July 12, 2010 6:59 AM. "The Senate subcommittee charged with NASA oversight will present a $19 billion bill this week that kills President Barack Obama's proposed shakeup of the agency's human-spaceflight program, in the process cutting billions from commercial rocket and technology projects that supporters say would have benefited Kennedy Space Center. A draft of the bill, obtained by the Orlando Sentinel, was presented to NASA last week by the committee, chaired by Florida Democratic U.S. Sen. Bill Nelson. So far the White House has not commented on the bill, but several Florida Space Coast leaders have expressed concern about its impact here." Keith's note: Additional detail via NASA Watch sources: This authorization bill covers FY 2011-2013 - i.e. the period of time that the Obama Administration will have influence on budget plans. During FY 2011- 2013 President Obama had wanted to spend $3.3 Billion on commercial space. The draft legislation under consideration would now utterly gut the President's proposed commercial program to the point that its value as a "commercial" activity would be called into question. In the proposed draft, commercial activities would now receive the following: $150M in FY 2011, $275M in FY 2012, and $464M in FY 2013 - for a total of $889M. That's barely a quarter of what the White House proposed. Moreover, NASA would also be precluded from entering into any commercial crew contracts in FY 2011. In addition, work on an advanced hydrocarbon engine would be halted. Also, all of the new technology that was to be funded gets eviscerated as well by as much as 50%. At face value, this "compromise" would reverse the White House's plans and bring back a "lite" version of Constellation and fatally wound any attempt at a meaningful commercial participation in the future of American space exploration. This authorization bill will eventually find its way to the President's desk. Will he sign it? I don't think so. Add in a looming CR, and America's human spaceflight program is about to go into a year of stasis and confusion. By Keith Cowing on July 12, 2010 6:50 AM. "Now the Oklahoma Gazette reports that Rocketplane's owner, George French, has filed Chapter 7 bankruptcy papers in his home state of Wisconsin, covering Rocketplane as well as the Kistler and Global subsidiaries. French is also filing for personal bankruptcy. The documents show assets ranging from $108,000 to $287,000, and liabilities of more than $8 million. The Chapter 7 bankruptcy process would lead to the liquidation of Rocketplane's assets - and the death of the company's outer-space dreams. "We didn't leave a nickel on the table," the Gazette quotes French as saying. "We did what we said we could do. Unfortunately, we did not complete the program as originally conceived." By Keith Cowing on July 11, 2010 10:06 PM. "The bill, which lays out the direction of the nation's space program for the next three years, would add at least one more space shuttle flight, speed development of a heavy-lift rocket and move ahead with building a spacecraft to venture beyond low-Earth orbit. It would also slow down a rush to invest in commercial rockets by requiring companies to demonstrate their capabilities before receiving large contracts for delivering astronauts to the International Space Station, said a staff member who was not authorized to speak for attribution." Keith's note: Word has it that there is serious consideration being given in the Senate to making dramatic changes to President Obama's proposed FY 2011 budget and the way that it restructures NASA. A new NASA Authorization bill is scheduled to be marked up on Thursday by the Senate Commerce, Science, and Transportation Committee's Science and Space subcommittee. By Keith Cowing on July 11, 2010 9:51 PM. "President Barack Obama's controversial plan to turn away from a moon mission and focus instead on new space-exploring technologies will "significantly raise the profile" of NASA Glenn Research Center, says Charles Bolden, head of the space agency. "Today's visit is part of an ongoing effort to develop and grow the relationship between NASA Glenn and the business community. NASA Glenn is one of Cleveland's best assets and today's visit is an important step to show NASA Headquarters that Glenn should be one of NASA's best assets." "Lugo was named Glenn's deputy director in November 2007. Before that, he served as deputy manager of the Launch Services Program at NASA's Kennedy Space Center in Florida. Lugo began his NASA career at Kennedy as a cooperative education student in 1975." By Keith Cowing on July 11, 2010 9:40 PM. "The Nelson authorization bill would also take a "walk before you run" approach to commercial space development. NASA would be required to complete "studies, assessments, and milestones" before commercial service to the space station starts. The Senate appropriations subcommittee that controls NASA spending hasn't met yet, and its ranking member is Shelby. "As the ranking member," he said Friday, "I will continue fighting to refocus NASA on its core mission of advancing the U.S. human space flight program and preserving our nation's capabilities, which this administration is actively trying to dismantle." "I believe NASA's recent contract "descoping" actions - which forced prime contractors to cancel or reduce subcontracts - are a direct violation of a provision in the 2009 Omnibus Appropriations Act. That bill did not give NASA permission to gut some projects and programs to fund others with Constellation and if it is found that NASA violated this provision, then NASA will be held responsible." "About one hundred people turned out for the kickoff meeting of the Huntsville Space Professionals at UA-Huntsville's Chan Auditorium Friday afternoon." "HSP plans to hold a job fair next month and provides updated news from Washington about NASA-related decisions made by Congress. The group's website lists employment opportunities, which are not exclusive to those laid off. There was a political undertone to the meeting. Many who attended expressed frustration over cuts to the Constellation program. President Obama has proposed to kill the program. "Congress could revive Constellation next week if they had the mindset to do so," said Madison County Commissioner Mo Brooks, the GOP nominee for Alabama's Fifth Congressional District." By Keith Cowing on July 11, 2010 9:38 PM. "NASA is now primarily tasked with making people feel good about math and science, and in particular the Muslim world. No longer is it concerned with manned space flight, no longer is it charged with increasing our knowledge of the universe. It is charged with making everyone in the world and in particular Muslims feel good. The excellent news about that is it should not take nearly as much money to do this. We will no longer need to invest in rockets or spaceships. It is all about feelings. Perhaps, NASA can be combined into the Department of Education or the State Department." "Nowhere in the act was NASA assigned the responsibility to expand international relationships or reach out to "the Muslim world and engage much more with dominantly Muslim nations to help them feel good about their historic contribution to science and engineering." However, according to a recent interview NASA Director Charles Bolden gave to AlJazeera, that is exactly what President Obama informed him the space agency's foremost mission was to be." "When did it become the NASA administrator's top job to "reach out" to the Muslim world and make them "feel good?" In the past, NASA administrators were busy managing their agencies, but not Mr. Bolden. He is our ambassador to the Muslim world, speaking for President Obama. In the interview, Bolden sounded more like a politician or a diplomat than a NASA administrator." "So President Obama has charged NASA chief Charles Bolden with the crucial mission of finding a way to reach out to the Muslim world to help them feel good about their historic contribution to science, math and engineering ("NASA's crucial missions hijacked by liberal agenda," Page B9, Thursday). How condescending. I have read that Arab schools stress these achievements and rightly so. They don't need the U.S. to tell them to be proud of their heritage. Let's let NASA get on with the mission for which it was created." By Keith Cowing on July 10, 2010 5:54 PM. "The European Rosetta spacecraft has achieved a further milestone on its journey to the comet Churyumov-Gerasimenko. On 10 July 2010 at 17:45 CEST, the orbiter flew past asteroid Lutetia on its second and final pass of the asteroid belt at about 15 kilometres per second - 54,000 kilometres per hour - merely 3162 kilometres from the asteroid. The confirmation was delivered at 18:10 CEST to ESA's European Space Operations Centre in Darmstadt." By Keith Cowing on July 10, 2010 12:49 AM. "Bolden called a couple of lawmakers with the news on June 28, after his interview with the Middle East news organization but before it aired, the newspaper reported. "He ran down some of the things from the president's new space policy, and mentioned outreach to Muslims," Rep. Pete Olson, the top Republican on the House Subcommittee on Space and Aeronautics recalled to the newspaper. "That stunned me. I didn't believe it." Keith's note: Oops. I guess Rep. Olson missed the comments by fellow Republican Rep. Bill Posey some four months earlier on 23 Feb 2010 on the House floor - as featured on NASA Watch at the time. I guess we can give Rep. Olson a waiver on this since this was one of those 3 minute things that members give in the late afternoon to an empty chamber that only C-SPAN junkies ever see. Of course, there other public statements about this policy that predate the Al Jezeera interview - it would seem that Rep. Olson missed them as well. "Soon after President Barack Obama stood in Cairo, just over one year ago, and spoke of Partnership between the United States and Muslims around the world, he asked NASA to change that ratio by reaching out to "non-traditional" partners and strengthening our cooperation in the Middle East, North Africa, Southeast Asia and in particular in Muslim-majority nations." "In the place of the canceled Ares and Orion hardware, we now have increased support for education, increased spending on the discredited global warming hypocrisy and subsidies to several new commercial rocket companies. And, oh yes, don't forget a new outreach program to Muslim countries without established space programs." By Keith Cowing on July 9, 2010 4:40 PM. "U.S. Sen. David Vitter of Louisiana opened this morning's ceremony celebrating the delivery of NASA's last shuttle external tank by ripping President Obama's "radical" proposals for the space agency. "You all deserve better, and the nation deserves better," he told an audience of hundreds of NASA and contractor employees at the Michoud Assembly Facility near New Orleans, earning loud applause." By Keith Cowing on July 9, 2010 3:46 PM. Location: 33 kilometers over Igualada (Barcelona, Spain). Local Time: July 8th, 2010 at 10:15 am. Object: Spain's Team Football Jersey for the World Cup 2010 in South Africa. Occasion: XIV European Balloon Festival. Reason: "La Roja" has reached unchartered heights. Their success is inspiring for all of us that believe there are no limits. This is our humble tribute." By Keith Cowing on July 9, 2010 1:22 PM. "NASA has given gamers a taste of lunar adventure with release of Moonbase Alpha, an exciting new, free online video game. - It is the first game in NASA's Learning Technologies project. The project supports the delivery of NASA content through interactive technologies such as virtual worlds, games and software applications to enhance science, technology, engineering and mathematics, or STEM, education. - Moonbase Alpha is a precursor to a planned NASA-based massively, multiplayer online game project. The project is being designed to have content and missions that require players to gain and demonstrate STEM knowledge to succeed." "As college students prepare to return to the classrooms, many of them are carrying an Apple laptop. An Apple MacBook is favored by 47 percent for those college students who've yet to purchase a computer and 27 percent of students who already own a laptop are fans of the Cupertino, California company. As Fortune points out, this is a complete turn-around from 2005, when 47 percent of laptop buyers chose Dell. This year, Dell is the No. 2 (24 percent) laptop brand chosen for college dorms, followed by HP with 15 percent of the college market and Toshiba with 10 percent, according to research firm Student Monitor, a New Jersey firm who has been doing these surveys for nearly a quarter century." Keith's note: Alas, this game only works on Windows-based computers. This is rather surprising given the large (and growing) market percentage of Mac OS computers in schools and the rising popularity of iOS platforms such as iPad and iPhone, and those devices running Android OS as well as Linux, Ubuntu, etc. Sure, you can go through extra hoops to make it run on a Mac by booting your Intel-based Mac in Windows, but there is no reason why the developers cannot make it easy - instead of hard for people to run this on the computers they use. The whole idea is to enlarge the audience for what NASA does, not limit it. Alas, if you go to the game's official website there is no page or link that leads you to information about what other platforms will be supported and when. Yet if you go to their Facebook page there is a note that says "No other platforms currently planned." FAIL. On a Facebook Discussion thread, Ryan Hayle notes: "I have submitted the following email to several contacts at NASA and Virtual Heroes demanding the immediate release of Moonbase Alpha under an Open Source License. ... It is simply not acceptable for a government agency to release a product funded by our tax dollars which requires the purchase of an expensive, proprietary operating system from a single private corporation. ... While I can understand if you do not have the resources to invest in releasing a Linux version of the product at this time, I must insist that you release all of the source code, artwork and any other associated data files for this game to the American public immediately under an Open Source license. I am confident that we will be able to port this product to function on Linux, Mac OS and other operating systems, sharing our work back with our fellow citizens in a true spirit of cooperation." Indeed, if NASA were to do what Ryan suggests, then you might suddenly find this game being used all over the world. Isn't this what the President wants NASA to do? Keith's update: According to Ann Marie Trotta at NASA PAO: "As mentioned in the press release, the initial release of Moonbase Alpha is a proof-of-concept endeavor. To stay within allocated resources for this trial, NASA opted to release it for the broadest online population, which uses the PC/Windows platform. The agency already is planning to expand to a broader application base for future games." By Keith Cowing on July 8, 2010 11:08 PM. "Lawmakers across Capitol Hill, both Democrats and Republicans, were surprised to learn recently that the Obama administration has made reaching out to Muslim nations a top priority for the space agency NASA. They will probably be more surprised to learn that administration officials told the Middle East news organization Al Jazeera about it before they told Congress." Keith's note: Oh how lazy we all are. ESPECIALLY the media. Use Google, once in a while. You might learn something. By Keith Cowing on July 8, 2010 8:55 PM. "You know how Wile E. Coyote straps himself to the rocket and lights the fuse? And it burns. And burns. Silence. Nothing. He's poised, hopefully, awaiting launch. We wait, painfully, for the bad thing certain to happen. That's what we've been doing for almost a week now, anticipating the explosive public reaction to word from NASA chief Charles Bolden that President Obama has tasked his once-fabled space agency with a brand-new earthbound mission that has absolutely nothing to do with space." "The earliest Islamic civilizations placed a high value on science and learning while Europe was going through the self-inflicted lobotomy of the Middle Ages. Only the most fierce Muslim-hater will pretend otherwise. But it speaks to the priorities of the current White House administration that even while NASA's manned exploration programs are cancelled and America's military space efforts fall behind due to lack of funding, the best and brightest of America's scientific minds find themselves turning to the task of making a billion people feel better about themselves." "So, why isn't Bolden heading up the Peace Corps if he's in the "help them feel good" business?" "Obama is boldly going where no president has gone before. It is a continuation of the president's subjugation of himself (bowing to foreign leaders) and the country he is charged with leading by obsequiously kowtowing to a people for whom advancement to the Middle Ages would be a step up." By Keith Cowing on July 8, 2010 8:45 PM. "Given the choice, I'd rather stick a fork in my hand than write about my personal life. Unfortunately, it seems that I don't have any other option. Several awful things have been widely reported that are simply false, but a falsehood uncorrected may as well be truth. I really wish there were not this level of attention directed towards personal matters in the first place, but the legal filings in a California divorce are public information, my ex-wife (Justine) is an extremely prolific blogger, and certain journalists seem to have a creepy fixation on my personal life. Much as one may wish for privacy, in the 21st century it just doesn't exist." Keith's note: Posting items of a personal nature such as this would normally go well beyond the boundaries of what I consider to be appropriate for NASA Watch. But given that prominent news publications have made frequent, and so it would seem, inaccurate references to Elon Musk's personallife while trying to "report" on SpaceX, I felt that Elon needed a chance to respond to these inaccuracies via NASA Watch. By Keith Cowing on July 8, 2010 7:12 PM. "Under a 3-year agreement between NASA and the non-profit Arab Youth Venture Foundation (AYVF), up to 12 UAE students per year will be participating in the EAP. The initial group of three students (Shamma Al Qassim, Hazza Bani Malek, and Hamad Rajab) arrived in mid-June to begin a 10-week internship at NASA's Ames Research Center. The students will be working on a variety of projects including the space shuttle and International Space Station, deep space missions, solar system exploration, and aeronautics research." By Keith Cowing on July 8, 2010 7:05 PM. "NASA Had Not Taken Actions to Address Two Recommendations. At the time of this review, NASA Headquarters had not addressed the recommendation from the Safety and Mission Assurance report to implement a NASA-wide alcohol testing program because no NASA official had been assigned responsibility to address the issue." "NASA Was Unable to Address One Recommendation. NASA was unable to address a Committee recommendation that it fully integrate behavioral health information derived from psychological testing evaluations into the final selection process of astronaut candidates if the information is found to be useful." By Keith Cowing on July 7, 2010 3:42 PM. Keith's note: Appearing on Fox News, Apollo 17 astronaut Gene Cernan just called on Charlie Bolden to resign. In essence Cernan said that if Bolden believes in what he was directed to say that he should resign and if he does not believe in this then he should also resign. "We (Armstrong, Lovell and myself) have come to the unanimous conclusion that this budget proposal presents no challenges, has no focus, and in fact is a blueprint for a mission to "nowhere." CERNAN: "Sometimes its hard to figure out Charlie. I some times don't know if he says what he believes or believes what he says, quite frankly. He's a good man, I respect him - I have for a long time - and he's a friend. But if he really believes what he is quoted as saying about this particular subject ... I hate to say this but I don't think Charlie knows or understands what the leadership role of the NASA Administrator really is. International cooperation is one thing. But in the manner in which he put it - the three major objectives in his leadership role as NASA Administrator ... it just does not fit in what NASA was designed - what the charter of NASA really is. If he believes this - and I hate to say this is - its pretty strong and heavy - then I think we ought to ... that leveler heads ought to call for his resignation because that is not what his job is. And if he doesn't believe it, he ought to stand up if he doesn't support the president' s proposal ..."
By Keith Cowing on July 7, 2010 2:31 PM. "RUSH: That's right. That's precisely why it's wrong. Obama is the new chief executive and all of America's wrong. The original mission statement of America is wrong. That's the Constitution, and that's under assault, too. Not just the initial mission statement of NASA. If he's going to run around and say that NASA's purpose now is to spread science and math understanding to Muslim countries and to recognize their contributions to math and science, then you can imagine what this bunch thinks of the Constitution." "GLENN: But imagine how condescending that is to say that NASA's going to go over and say, look who's been smart in the past, look what you've done. Who can take an abacus and turn it upside down? You can. I mean, that is the most condescending thing I've ever heard. Make them feel good about their history. And isn't that so very progressive. Make them feel good. That's the charge of NASA? That's what we're doing with NASA money?" "So don't fault Bolden, fault his commander in chief. Every time conservatives underscore the idea that Obama is not a Muslim, he does everything within his power to cozy up to the very powers that hate our guts and dominate the Muslim world." By Keith Cowing on July 7, 2010 12:47 PM. @waynehale: "Updated my blog a few minutes ago announcing my retirement at the end of the month. Its been great!" "Working at NASA has been a lifelong dream; I often tell people that I would have paid them to let me in the door rather than the other way around. It has been a privilege and an honor to work in this place and with these people. The achievements that we have made together will have lasting significance for all humankind. I want to especially thank my many wonderful co-workers who are so dedicated, innovative, and hard working. I wish them every success in the future with all my heart." By Keith Cowing on July 7, 2010 11:46 AM. "The Orion crew exploration vehicle has successfully completed the Phase 1 Safety Review of NASA's Human Rating Requirements for space exploration in low Earth orbit and beyond. The NASA/Lockheed Martin Orion team earned the approval from NASA's Constellation Safety & Engineering Review Panel (CSERP) upon completion of the review, an essential requirement for the Orion program to move forward to the Critical Design Review and Phase 2 Safety Review." By Keith Cowing on July 7, 2010 11:10 AM. "QUESTION: Can you speak to why the NASA administrator was doing outreach to the Muslim community? There was an article over the weekend. MR. TONER: It's an excellent question. I do not have an answer for you on that. I can try to - or I encourage you to talk to our NASA colleagues. I mean, obviously, the new space policy has a more international approach, and we unveiled that, I believe, from the White House last week or a week ago - yeah, a week ago Monday, today. Today's Tuesday. QUESTION: Isn't that the role of the State Department and not the space agency, obviously? MR. TONER: Well, I mean, I think it's an interagency cooperative effort. And so obviously - but I - as to specific comments today, I think I saw it on TV, I didn't listen to them closely enough to have any response for you. I can just say that part of the new approach to space - this Administration's new approach to space is to engage in international partners and that would - obviously, that would include in the Muslim world." Keith's note: Gee, of all places, why would anyone ask the State Department about a recent visit by a senior Administration official to several mideast countries - at the request of the White House? By Keith Cowing on July 7, 2010 6:29 AM. "The president is known to be a fan of the old "Star Trek" series, which frequently moralized on the pitfalls of "imperial condescension." Mr. Bolden may find some in the Muslim world more intransigent than a Klingon as he attempts to launch them into the space age." "Wouldn't it be interesting to find out what Neil Armstrong, Buzz Aldren (sic), or any of the other former NASA astronauts think about the new goals established for NASA by the president of the United States?" "Was this the big liftoff? Well, no. NASA Administrator Charles Bolden elaborated on the agency's "priority" to reach out to Muslim countries during a July 1 appearance on the Al Jazeera network. Conservatives were vexed, and the White House predictably sprang to his defense. But the offending glare is not new, if a speech Mr. Bolden made June 15 at the American University in Cairo is any gauge." "MichelleMalkin.com readers have answered the call of duty! Last night, inspired by reader Duke, I put out a call for NASA logo redesign Photoshops to mock Team Obama's Muslim-pandering makeover of the space program. Entries are pouring in to my mailbox. Had to share some of the best and most pointed images with you right away. Pick your favorites:"
"Of course, since an Obama official made completely noncontroversial comments about reaching out to the Muslim world in order to gain contributions to the fields of science and technology, the right-wing media freaked out." "But I still found Bolden's comment troubling, for a reason of my own: since when is it U.S. government policy to offer or refuse cooperation with various nations based on the religion their people practice? Last time I checked, the Constitution expressly forbid the establishment of religion. How can it be consistent with that mandate and the deeply held political and cultural values that it expresses for the U.S. government to "reach out" to another government because the people it rules are mostly of a particular faith?" By Keith Cowing on July 7, 2010 5:45 AM. Keith's 1 July note: NASA's New AA for Public Affairs is David Weaver. He starts work on 19 July at NASA HQ. Details to follow. "President Barack Obama has appointed Rep. Christopher Van Hollen's top aide to be the chief spokesman for the National Aeronautics and Space Administration." By Keith Cowing on July 6, 2010 5:00 PM. "The Houston-based company employs approximately 8,100 employees at its Florida, Texas and Alabama sites, including nearly 3,000 in the Houston area. The cuts will reduce as many as 400 positions from the Houston office." "The Houston-based company said in a news release that 800 to 1000 jobs could be lost in Florida." "USA said it employs approximately 8,100 employees at its Florida, Texas and Alabama sites. The layoffs will hit about 800-1000 employees in Florida, about 300-400 employees in Texas and about 10 in Alabama, the company said." "Our workforce has known for several years that the space shuttle program has been scheduled to end, but layoffs are always difficult for everyone involved," said company President/CEO Virginia Barnes. "The accomplishments of this team are unmatched in human spaceflight. We acknowledge the tremendous talent and commitment of our teammates and congratulate them on their achievements." "People being laid off now is just the beginning. Many more thousands will be laid of as the shuttle programme is wound down," Keith Cowing, the editor of space specialist website Nasa Watch, told the BBC World Service." By Keith Cowing on July 6, 2010 1:56 PM. "Michael Griffin, who headed NASA during the last four years of the Bush administration, says the space agency's new goal to improve relations with the Islamic world and boost Muslim self-esteem is a "perversion" of NASA's original mission to explore space. "NASA was chartered by the 1958 Space Act to develop the arts and sciences of flight in the atmosphere and in space and to go where those technologies will allow us to go," Griffin said in an interview Tuesday. "That's what NASA does for the country. It is a perversion of NASA's purpose to conduct activities in order to make the Muslim world feel good about its contributions to science and mathematics." "But the comments have caused a kafuffle. The Washington Examiner's Byron York interviewed former NASA administrator Michael Griffin, who headed the space agency during the last four years of the administration of President George W. Bush, who called Bolden's stated charge for NASA a "perversion of NASA's purpose." Keith's note: Oh great. Leave it to Mike Griffin to get on the train to crazy town and use the words "NASA", "perversion", and "Muslim" in the same sentence. Thanks for elevating the conversation, Mike. Why Didn't Bolden Just Say So In The First Place? By Keith Cowing on July 6, 2010 1:35 PM. "Bob Jacobs, NASA's assistant administrator for public affairs, told Fox News on Tuesday that Bolden was speaking of priorities when it came to "outreach" and not about NASA's primary missions of "science, aeronautics and space exploration." Still, he said, "international cooperation and collaboration is important to the future of space exploration." Jacobs said he will let the administrator's comments "speak for themselves," but said it was unfortunate those comments are now being viewed through a "partisan prism." 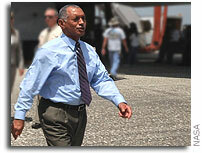 Keith's note: From now on I think NASA should just send Bob Jacobs on these trips and not Charlie Bolden. This would certainly cut down on all of the confusion. By Keith Cowing on July 6, 2010 11:49 AM. "This is a new of fatuousness. NASA was established to get America into space and to keep us there. This idea of 'feel good about your past' scientific achievements is the worst kind of group therapy, psycho-babble, imperial condescension and adolescent diplomacy. If I didn't know that Obama had told him this, I'd demand the firing of Charles Bolden." "Houston, we have a problem -- Muslim countries are feeling insecure. NASA Administrator Charles Bolden, interviewed yesterday on the Arabic news station al-Jazeera, said President Obama had given him three missions, the "foremost" of which was to improve relations with the Muslim world." "NASA is not only a space exploration agency," Bolden concluded, "but also an Earth improvement agency." At the same time, Bolden gave a bleak assessment of the space part of NASA's mission. More than 40 years after the first moon landing, he told al-Jazeera, the U.S. can no longer reach beyond Earth's orbit without assistance from abroad. "We're not going to go anywhere beyond low Earth orbit as a single entity," Bolden said. "The United States can't do it." Its space initiatives junked, its administrator rhapsodizing about helping Muslims "feel good" about themselves: That is the new NASA." "Would be very interesting to find out just how much this self-esteem "outreach" effort is costing the American people. Anywhere in the stratsosphere of as much as Project Constellation cost before it was effectively axed by this administration, costing along with it thousands of jobs?" "The website NASA Watch reported Bolden's interview comments a few days ago, but they seem to have hit the fan in a larger-scale Monday. Bryan York of The San Francisco Examiner wrote in response: "From moon landings to promoting self-esteem: It would be difficult to imagine a more dramatic shift in focus for an agency famous for reaching the heavens." "Bolden denied, however, that he was taking on any kind of diplomatic role. "Not at all. It's not a diplomatic anything," he said." Keith's note: News of this video is spilling off of Drudge Report and the fringe websites over into mainstream. This is just a quick snapshot of what is being posted out there. In essence, the question seems to be, why is Charlie Bolden off talking to Middle East folks when he is laying off thousands of Americans back home? And is talking to one group of foreign nations more important than focusing on what NASA is supposed to be doing? I will be the first one to suggest that NASA needs to vastly expand its sphere of relevance and inclusiveness wellbeyond traditional boundaries. But the way this comes off in Bolden's comments on Al Jazeera, working with Muslim countries is more important than virtually everything else that NASA is CHARTERED to do ... more important than reinvigorating our space industrial base, protecting the Earth, doing quality science, enhancing aviation, exploring the universe, etc. Charlie Bolden was on an overtly diplomatic mission during this trip. To deny (as he did) on Al Jazeera that he was doing so is an insult to the intelligence of everyone concerned. Bolden has more on his plate than he can handle at NASA right now. The best thing he can do for America's space program is stay home and focus on his NASA responsibilities and not go off on TDY with the State Department. One small problem: there is no mention of this priority on Muslim nations that Bolden mentions in the full text of the new National Space Policy nor in the Fact Sheet issued on the policy, nor is there any mention in this briefing with State Department officials. However, the policy does say "Expand international cooperation on mutually beneficial space activities to: broaden and extend the benefits of space; further the peaceful use of space; and enhance collection and partnership in sharing of space-derived information" but it does not specifically and preferentially call out one subset of the world's nations for special attention as Bolden has done. If Bolden is making these statements about the three goals that he is working on (above all others), one would think that these three goals would resonate and be consistent with the nation's avowed space policy. If he is not saying things that reflect this policy, then either he is freelancing (again) on things, or one has to question whether the National Space Policy, as announced, actually does reflect the nation's true space policy or just a portion thereof. Go ahead and comment folks. But if the racist, bigoted remarks starts to show up again I'll shut comments off on this posting - just as I did on the earlier one. By Keith Cowing on July 6, 2010 7:41 AM. "Like many American families across the country, the Stern family of Colorado celebrated the Fourth of July holiday together on Sunday. But instead of a traditional barbecue or picnic, the family took to the skies for a novel weightless daytrip on a Zero Gravity Corporation (Zero-G) aircraft. Here, journalist and eldest Stern daughter Sarah Stern describes the experience of the July 4th trip, which was arranged as part of a project led by her father - planetary scientist Alan Stern - investigating the scientific uses of zero gravity and suborbital spaceflights at the Southwest Research Institute." By Keith Cowing on July 4, 2010 10:01 PM. "At 12:17pm EDT, Progress M-06M(38P) docked successfully to the SM (Service Module) aft port under KURS autopilot control, followed by a final DPO post-contact thrusting burn, docking probe retraction and hook closure ("sborka") after motion damp-out while the ISS was in free drift for ~20 min (12:17pm-12:37pm). At "hooks closed" signal, the SM returned to active attitude control, maneuvering the ISS to LVLH TEA (local vertical/local horizontal Torque Equilibrium Attitude) at ~12:37pm." By Keith Cowing on July 2, 2010 1:55 PM. "A short but important course-correction maneuver kept New Horizons on track to reach the "aim point" for its 2015 encounter with Pluto. The deep-space equivalent of a tap on the gas pedal, the June 30 thruster-firing lasted 35.6 seconds and sped New Horizons up by just about one mile per hour. But it was enough to make sure that New Horizons will make its planned closest approach 7,767 miles (12,500 kilometers) above Pluto at 7:49 a.m. EDT on July 14, 2015." By Keith Cowing on July 2, 2010 1:40 PM. "Docking for the ISS Progress 38 has been delayed due to a loss of telemetry. Flight controllers have reported the resupply craft flew past the International Space Station. Managers are working to determine the next course of action before resuming docking activities." Charlie Bolden: Stealth Middle East Diplomat? By Keith Cowing on July 2, 2010 1:00 AM. "Bolden: I am here in the region - its sort of the first anniversary of President Barack Obama's visit to Cairo - and his speech there when he gave what has now become known as Obama's "Cairo Initiative" where he announced that he wanted this to become a new beginning of the relationship between the United States and the Muslim world. When I became the NASA Administrator - before I became the NASA Administrator - he charged me with three things: One was that he wanted me to re-inspire children to want to get into science and math, that he wanted me to expand our international relationships, and third, and perhaps foremost, he wanted me to find a way to reach out to the Muslim world and engage much more with predominantly Muslim nations to help them feel good about their historic contribution to science, math, and engineering." Question: Are you in some sort of diplomatic role .. to win hearts and minds? Bolden: NO NO, not at all. Its not a diplomatic anything. What it is - is that it is trying to expand our outreach so that we get more people who can contribute to the things that we do - the international Space Station is as great as it is because we have a conglomerate of about 15 plus nations who have contributed something to that partnership that has made it what it is today ..."
Keith's note: I have shut off comments on this post. I am tired of reading hate language that people have been trying to post. These utterly off-topic rants have come from both sides of the political spectrum. This hate speech will not be tolerated on NASA Watch. Take it somewhere else. FWIW YouTube has also disabled comments on this video. By Keith Cowing on July 1, 2010 9:50 PM. From Astro_Wheels: "Best Caption Contest - I am floating through the transfer hatch to my position in the Soyuz capsule, all suited and ready to take 'Olympus' for a spin around the block for re-docking. Would love to hear your ideas for a caption, maybe "Did you guys see the keys"?..." Why Aren't We Hearing More About JSC's Project-M? By Keith Cowing on July 1, 2010 7:41 PM. "This video is of NASA Project M Lander free flight test at Armadillo Aerospace outside of Dallas. The lander launched on June 23rd 2010. This is the prototype of the lander that will launch a version of Robonaut on future exploratory missions." Keith's note: This is an interesting project, to be certain - and Armadillo's involvement is innovative and is to be commended. But I am wondering how or why this project is being funded (and is building hardware) at a time when other ESMD lunar surface activities are grinding to halt (Altair etc.). Given that NASA has yet to decide what places it is (or is not) going to - with the Moon no longer being the core focus, it is a bit curious that JSC is planning to land something on the Moon in 2013 and refers to this hardware as something that "will launch" Robonaut. Not "might launch" or "could launch" or "if approved ..."
Also, it is a little weird that it is rather difficult to find anything detailed on this project at NASA.gov unless you happen to look at the Robonaut page at NASA JSC which has a link to a document titled "Landing a Humanoid Robot on the Moon in a 1000 Days "ProjectM". Curiously, this white paper is not even hosted at NASA.gov but rather is posted here at Scribd.com. You can also download it as a PDF here at SpaceRef. It is also a little unusual that the NASAProjectM YouTube page is not listed as a channel on NASA's Official YouTube page. This is cool stuff - and you would think that the NASA.gov home page would be featuring it and that press releases would be issued each time that a successful test launch is completed. By Keith Cowing on July 1, 2010 12:24 PM. "NASA is targeting approximately 4:33 p.m. EDT on Nov. 1 for the launch of space shuttle Discovery's STS-133 mission and 4:19 p.m. EST on Feb. 26, 2011, for the liftoff of shuttle Endeavour's STS-134 flight from the Kennedy Space Center in Florida. The target dates were adjusted because critical payload hardware for STS-133 will not be ready in time to support the previously planned Sept. 16 launch. With STS-133 moving to November, STS-134 cannot fly as planned, so the next available launch window is in February 2011." Hutchison Pleased with Short-Term Shuttle Extension to 2011 - Calls Move "An Important First Step"
"Senator Kay Bailey Hutchison (R-Texas), Ranking Member on the Senate Commerce, Science, and Transportation Committee, today said she was pleased to see NASA delay the launch of the space shuttle Discovery to November 1, 2010, and push back the scheduled launch of space shuttle Endeavour to February 26, 2011. Senator Hutchison has consistently stated that the President's NASA proposal should include a short-term stretch out of the shuttle program's remaining flights in order to protect the nation's $100 billion investment in the International Space Station." "Today, following NASA's decision to extend the Space Shuttle program until at least February 2011, Congresswoman Suzanne Kosmas (FL-24) issued the following statement: "Today's news that the Shuttle program has been officially extended until at least February of next year is a welcome development that will help preserve jobs and ease the transition for the Space Coast. The extension shows the importance of our successful efforts to eliminate the hard deadline for Shuttle retirement, which would have ended the Shuttle program in September of this year." By Keith Cowing on July 1, 2010 12:18 PM. "NASA Radar returns first high-resolution view of an unusual crater near Moon's north pole Mini-RF, a synthetic aperture radar on board NASA's Lunar Reconnaissance Orbiter, recently imaged a potentially ice-rich crater near the north pole of the Moon. Located at 84N, 157W, this permanently shadowed crater, about 5 miles (8 kilometers) in diameter, lies on the floor of the larger, more degraded crater Rozhdestvensky (110 miles, or 177 kilometers in diameter). With no sunlight to warm the crater floor and walls, ice brought to the Moon by comets or formed through interactions with the solar wind could potentially collect here." By Keith Cowing on July 1, 2010 12:07 PM. "It is important to note that the report highlights that the cost-effectiveness of maintaining the operations-ready status of the C-9 and currency of its crew has never been assessed. Since the primary threat to ZERO-G's service continuity to NASA is its own insufficient demand, NASA may be a contributor to this risk and should assess the benefit of continuing to invest in the C-9 versus restructuring the current contract with ZERO-G. To date, ZERO-G has invested over $1.5 million to improve its baseline commercial capability to meet NASA's requirements. Total net revenue from the past two years has not allowed ZERO-G to recoup its initial investment." By Keith Cowing on July 1, 2010 12:00 PM. "A planet only about eight times the mass of Jupiter has been confirmed orbiting a Sun-like star at over 300 times farther from the star than the Earth is from our Sun. The newly confirmed planet is the least massive planet known to orbit at such a great distance from its host star. The discovery utilized high-resolution adaptive optics technology at the Gemini Observatory to take direct images and spectra of the planet." By Keith Cowing on July 1, 2010 9:34 AM. "The most striking emphasis to me is something that is not at all new: a continued push to get the government out of the rocket business. Commercial space has been a clear focus of the new NASA ever since the presidential budget was released in February. But what's not clear is if it will end up happening, given Congressional intransigence." "NASA junkies continue to howl at the Obama administration's plans for human space exploration, and with good reason: there's just no there there." "The Obama administration Monday unveiled a space policy that renounces the unilateral stance of the Bush administration and instead emphasizes international cooperation, including the possibility of an arms-control treaty that would limit the development of space weapons." "NASA was not part of the press conference. Pavel said the space agency was just one of "a couple of dozen departments around the table," including the State Department, the Joint Chiefs of Staff and the Department of Energy, meeting to develop a policy that "reflected the president's priorities." "Bretton Alexander, President of the Commercial Spaceflight Federation, stated, "The National Space Policy reinforces the President's new plan for NASA, particularly the use of commercial providers for transport of crew and cargo to the International Space Station. The National Space Policy recognizes the benefits of a robust commercial space industry and lays down a series of clear policies to enable further growth of this sector."